As we walked toward Piazza Venezia, I flipped open the pedometer on my belt. Italy was a great place to rack up miles for three weeks. 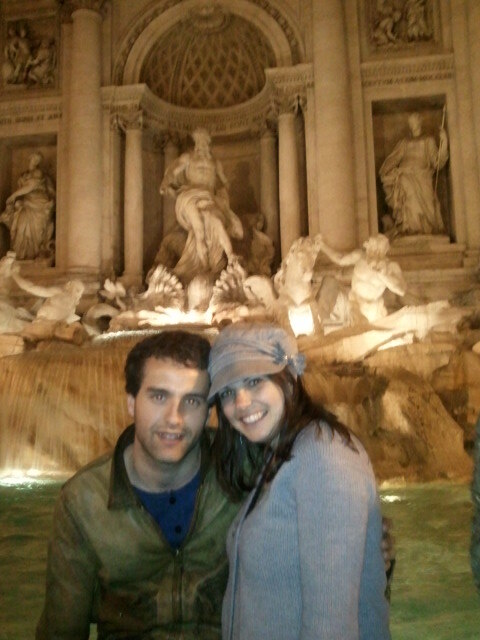 Venice, Florence, Cinque Terre, Rome. Now that I think about it, though, every place I’ve been since I started training for the Camino in January has been “meant to be” – for both the walking conditions and the people with whom I’ve had the pleasure of walking. Would I have started training in January were I not living through such a mild winter at Glenda’s house in Hayesville, NC? Would I have not continued training had I not spent ten days on Kiawah Island with all it’s options: walking trails, bike trails, golf courses and beaches? What about those unexpected ten days I got to go to Florida? Walking in 70 degree weather with Sarah and Russ surely beat the temps of winter in my home state of New York. Speaking of Sarah and Russ, I was pleasantly surprised by all the friends who accepted my invitations to join me on a walk. Leslie, Kate, and Dianna met me at different times on the Norrie/Mills Mansion Trail. Stacey, Lois, and Lynne on Kiawah Island. Sr. Peggy and John on the Walkway Over the Hudson. “I don’t know if I can keep up with you,” my friend Dora lamented when we took off from her doorstep in Maryland. I’d stopped there for an overnight visit on a drive between Asheville, NC and Hyde Park, NY. “I’m not walking for speed – just distance. I mostly stroll. You’ll be fine.” Indeed she was. In fact, we walked a trail her husband has volunteered to maintain for their town. Would I have known of his good work had Dora not agreed to take a walk with me? 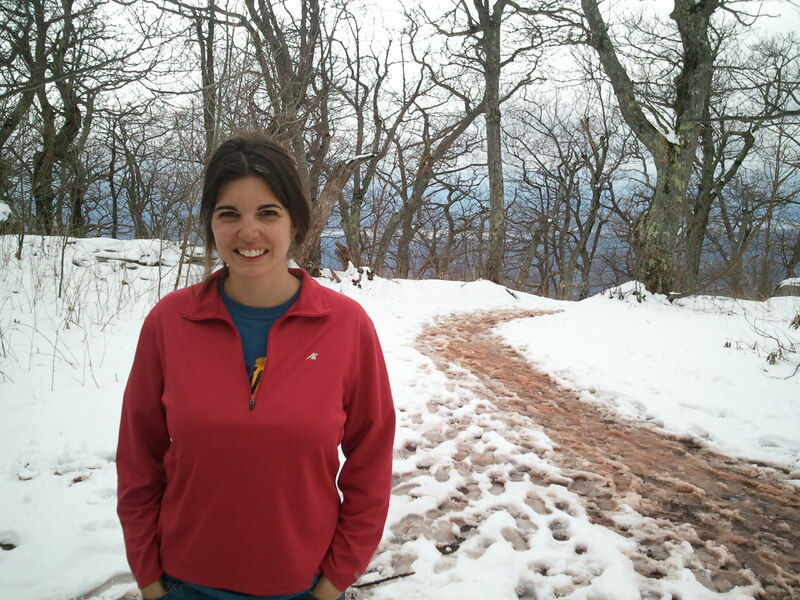 Kate did my first mountain with me which happened to also be the first time I hiked in the snow. I’m hoping I don’t have to repeat the snow experience in the Pyrenees. Greg and Scott were patient as I lagged behind on the hundreds of steps up the hillsides of the Cinque Terre. Dad and Mom walked the Walkway Over the Hudson with me. “How many more miles do you need to do today?” Dad asked. “This trail keeps going – Mom could turn around and get the car, then meet us further down the trail,” he suggested. Mom did just that while Dad and I added more miles to my daily total. I’ve done plenty of walking alone, as well. Sometimes that was fine. Other times, I needed the distraction of a phone call to keep me going. So thanks to Dawn, Tara, Terry, Mom, Jessica, Meg, Liz, Jenn and Jeff for taking my calls. So thanks to all those who put foot to pavement with me. And also thanks to those who were with me by phone on those days I needed someone to keep me going. Know that you all helped to get me to this point: in thirteen days I’ll get to see all this training pay off. With that, he and I started to create the opening monologue of the program that would tell our tale and subsequent demise. It was pouring rain when the three hikers decided to set out at 5pm to hike a steep, uneven trail overlooking Italy’s coastline. The two men were in the military and on leave. They wanted to make the most of their one day in Italy’s famed Cinque Terre region, so decided to set out despite the poor weather conditions. The woman with them had only met them that morning on the train and decided to join them. At their halfway point, unable to find the next trail marker, one of them forged ahead, down a rock path meant only for access to the water pipe that ran along it bringing water from one mountain town to the the town below it. Scott and I laughed at our tale as Greg forged ahead of us, scoping out our descent. “This is why I only tell my mother what I’m doing after I’ve done it. And you know what? I left a note on my dresser as to where I’d be today in case I didn’t return, and we’re no where near that.” I know this all could have had a bad outcome but – as the Dateline story would explain – I figured I was safe with two US Military-trained men. “Post here,” Scott said to me pointing to a rock wall. I figured out that “post” meant “put your hand here for support.” He graciously did that at all the tricky spots. Thanks to these two men, I made it down safe and sound, though soaking wet. And here I am able to tell you about it, so you won’t have to hear about it on Dateline. Maybe hiking a steep stone trail in the rain wasn’t my best idea. But it was my first afternoon in the Cinque Terre, and I wanted to get out there. So off I went climbing up and up and up towards the Madonna di Montenero Sanctuary high above Riomaggiore. The light rain didn’t faze me. I know there’s a chance I’ll have a wet day or two on the Camino, so I’ve gone out walking every day – rain or shine. In any other year of my life, rainy days would find me curled up indoors with a good book. I laughed to myself. I was impressed with how much I’d changed my habits and myself in preparation for the Camino. There was another change that needed to take place though. I needed some uphill practice. Miles of walking on flat paved surfaces are not going to help me hike through the Pyrenees (which I must do on my first two days of the Camino). So after settling into my hostel, I started up at 4:45pm. I saw just two women coming down during my forty-five minute hike up. They each had a pair of walking sticks. That’s when it hit me. I turned around and looked at the slick stones I’d just ascended. That’s not going to be fun walking down, I thought, wishing I had some walking sticks. I looked around but grapevines weren’t going to cut it. I plugged ahead, deciding the walk would be worth it, and I was right. 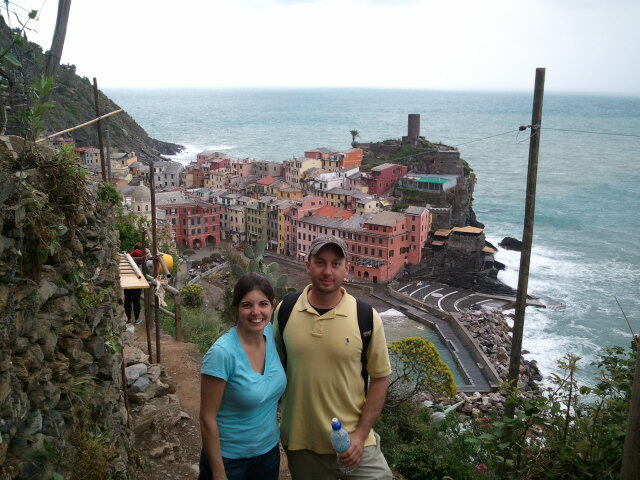 If you think the views from the Cinque Terre are amazing, hike a little higher. I’d post pictures, but am having some technical difficulties. The residents of Riomaggiore who put railings between their property and the trail – something to hold onto! The patches of grass growing between the stones – much better to step there than to slide down the slick stones. The two girls who passed me as I was walking down. At least if something happened to me, I knew there’d be two people coming back down the trail that I could call to. When I reached the bottom, I walk also thankful to have all my parts intact. No sprained ankle, no broken leg, not even a scratch. It would be devastating to get injured on these trails. Not only because I’m alone and far from home, but because then I wouldn’t be able to do the Camino. I’ll be much more careful here on out. Before hiking, I leave a note in my room as to where I’m going and when I should be back. If I can go with others from the hostel, I’ll consider it. But I do like being on my own schedule. The trails I’m taking are not back woods types of things. They’re pretty commonly used by tourists. The two trails that had the mudslide in October are closed. I’m not a rule-breaker, so will not be climbing gates to get to them. If I’m meant to die falling off a cliff into the ocean on the Italian coast, so be it. It’s a hell of a way to go, no? I could feel him behind me. He and I obviously didn’t have the same idea of ‘personal space.’ As he got even closer, I wondered if this short, tanned, elderly Italian man was trying to cut in front of me? I stood my ground in line for the automatic ticket machine. He shifted behind me, looking over my shoulder to the woman in front of me, watching as she typed her selections into the machine. He looked to the left at the man making his choices on the next machine. He looked around the station, nervously shifting his weight, still too close. The woman in front of me finished her transaction, gathered her ticket, and walked off. I approached the machine and was thrilled to see the British flag indicating the machine spoke my language. The man shifted behind me. Was he actually looking over my shoulder? I typed in Florence as my destination. “Firenze? (Florence? )” he asked. This was followed by a fluster of Italian while the man pointed from the paper in his hand to my screen to the trains. All I understood was that there was a train in three minutes and he wanted me to be on it. I looked at his ticket. The destination? Padova. I had no idea where that was. “Non capisco italiano (I don’t understand Italian),” I told him. He continued on anyway. “Parla inglese? (Do you speak English? )” I asked. Obviously not. He finally pointed to a ticket agent and waved his hand for me to follow him. In rapid-fire Italian he explained his dilemma to the bi-lingual woman. She then explained it to me: His ticket was for a train leaving in a few minutes. He bought it discounted on-line but needs to take a later train. He can’t get a refund so he’s trying to sell it to me. Florence -my destination- is on the way to Padova. She told me the ticket to Florence is normally 45 Euros and I could work out with him whatever I wanted. With that, I was on my way to Florence. Or so I thought. I stowed my backpack and secured my seat. I had no reservation for a place to stay in Florence. I had followed my intuition and not booked anything for my first night in Italy. This alarmed me only the day before I left. But the feeling passed. Now I knew why. I was due to meet my sister in Venice the next day. My rough plan had been to stop in Florence, spend the night, and hop a train the next day to Venice. In my hands was a ticket all the way to Padova – a mere half-hour from Venice. My five Euro savings increased to 18. I took the train all the way to Padova, found myself a place to stay, and the next day continued on.